In 1951, the year in which I graduated from Taunton High School, I left my hometown like Jack Whittington who went to London to seek his fortune, but I set my sights on Miami, Florida which I viewed as a sunny, warm, romantic paradise with pristine beaches, pastel buildings, sun bronzed goddesses, exotic vegetation, and limitless opportunities for an eager, talented, competent boy like me. I was a freshman to travel. I had never been anywhere before except for a four day trip to Washington, D.C. to play basketball in a National AmVets Tourney and was at that time a long bus trip. Inasmuch as I had been a leadout boy at the Dighton and Raynham Dog Tracks I got a job at the West Flagler Kennel Club in Miami along with my adopted brother, Tom Sawyer (I know the name strains credulity), but that was his real name and he was a week older than I, his mother who was my mother's sister died during childbirth and my mother and father adopted him. In those days there was no Route 95 and the trip was more than somewhat arduous along Route 1 which ran through hundreds of towns from Maine to Florida. Additionally, my car, a $75.00 1931 Ford Model A Coupe, couldn't go much more than 40 mph and we had to drive about 1300 miles. However, the exciting act of leaving Taunton forever and ever and hitting the road nullified any travel inconvenience. So arrive we did a bit travel worn, eager for adventure. I still have in my olfactory memory the smell of that foreign vegetation in St. Augustine and the hundreds of orange juice stands along the Florida roadways. Gasoline was about 15 cents a gallon and a quart of oil was 8 cents. After having gotten a room in a boarding house and making a trip to the Dog Track, we then tried to seek out more jobs as the track was operative only at night and the pay was $5.00 a night. Accordingly, we sought out a job agency in Miami and I was interviewed by the man who owned the agency, a fast talking, tough looking guy with a heavy New York City accent who asked me, "Well, kid, what can you do?" With all the innocent enthusiasm of youth, the confidence of the inexperienced, as well as the ignorance of a boy who had never been anywhere or who knew anything about the working world except delivering newspapers, shoveling snow, raking leaves, and picking radishes on a farm, I earnestly and emphatically told him, "Sir, I can do anything. Anything at all." As a look of disgust came upon him, he asked me, "Anything? Can you sing and dance?" The rude question was a dagger thrust into the heart of my ego, a pistol shot to my pride, a karate kick in the jejune head, a devastating blow to my sense of myself, a Homeric embarrassment to my callow spirit, and I felt that awful epiphany that I was no one and a knownothing all in one existential moment. I was totally horrified by this episode, wished not to be, wanted to be shrunk up, dried up, and gone with the wind. I wanted delivery from self for here was just another mean man, another mean guy who had power over me, a kid with no father. They were all the same: the cops, the teachers, the coaches, the businessmen, the laborers, the superintendents, the directors, the chairmen, the bosses. I needed to go around them. To paraphrase Blanche DuBois - I have always relied on the kindness of women. After a few more days of failure and self pity we had to leave - just about broke, dispirited, homesick and anxious to be again in our old beds in our old town which we had left forever. There was no sleep for 3 days other than naps while one of us drove. The muffler fell off around Waterbury, Connecticut and we worried all the way home that the cops would cite us for noise violations. 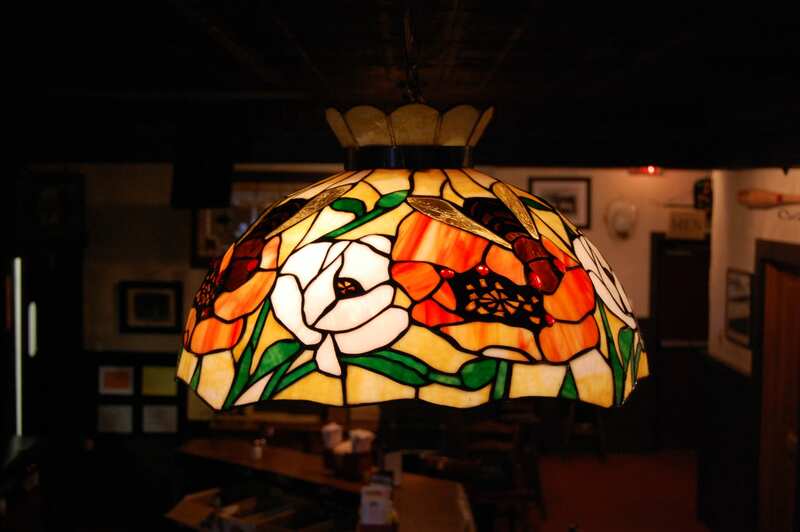 There was no place like home. Sixty years later and now in a position to render judgment on a person's ability to work at one of the restaurants that Jeff Moore and I own, I ask the candidates what they can do, hoping that one of them will say that he or she can do anything so that I may take the opportunity to gently, yes, gently chide them in a tone couched in kindness but with the ancient admonition: Oh, yes! But - can you sing and dance? 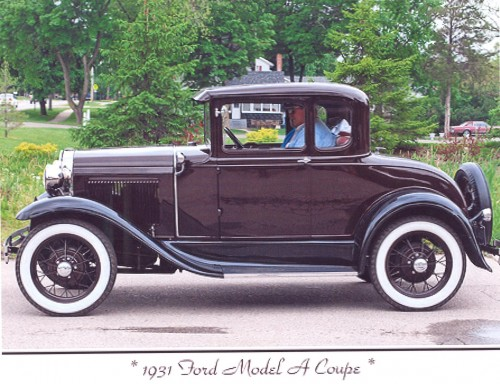 This photo is of 1931 Ford Model A Coupe, my first automobile. The Ford pictured, is one that has been nicely restored to its factory condition, whereas my car was 20 years old at the time I bought it, and it was nowhere as nice as the car in the photo. Nevertheless, I was proud to own it, and what could one expect for $75.00? When the car came out in late 1930, it was listed for $490 new. Tempus fugit. Real Huntsman from the Randle Brothers Farm in Wichita, Kansas took the top purse in the second running of the $25,000 American Greyhound Derby at the Taunton Dog Track. 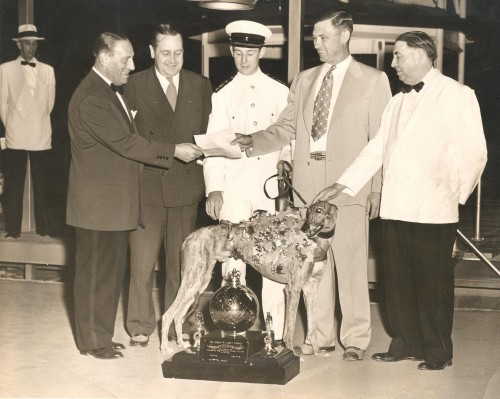 The world champion greyhound is seen in the foreground behind the Joseph M. Lindsey trophy won by the winner for his owner, Gene Randle. In the background, Managing Director Lindsey presents owner Gene Randle with the $15,000 check, purse award for the first place in the Derby. Besides, Lindsey, left to right, Thomas Beedem, Chairman of the Massachusetts State Racing Commission, Leadout Boy Robert Byrne, Randle and J. Barry Welsh, Director of Racing at Taunton Dog Track.